The Dantech Roesep® System is a modular processing system for recovery of loose roe products from Herring, Sardines, Pollock, and Salmon. By intercepting the valuable roe before it ends up in the waste stream we are able to guide the loose roe via a chute to a pump where we can begin the recovery process. Through a series of processes the system gently recovers loose roe and separates the waste water and waste products from the good quality roe thus enabling recovery of valuable By-Products. Dantech Roesep® has become a valuable processing system for some of the leading herring processors in Europe, who have been able to create value in product which was previously sent to fish meal. 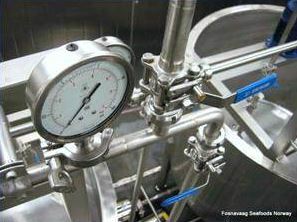 The Dantech Roesep® System is built to an extremely high standard in AISI 316 stainless steel and food grade materials. This standard is not usually found in the fish processing facilities and more at home in a dairy. With an ability to withstand salt water and brine use, the Dantech Roesep® System lasts for many years of production. The Dantech Roesep® System has an immediate and lasting benefit by turning what was waste into a valuable By-Product. Customers are able to increase value to their catch. Depending on product volume it is possible to archieve a very short Return on investment.